This page is about the Russian fighter LaGG-3-8. For other uses, see LaGG-3 (Family). The LaGG-3-8 is a rank I Russian fighter with a battle rating of 2.3 (AB), 2.0 (RB), and 1.7 (SB). It was introduced in Update 1.33. 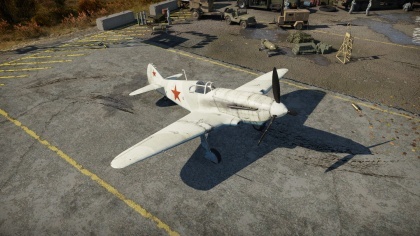 The LaGG-3-8 is one of the first aircraft in the game to be armed with a cannon. It is also one of three Soviet fighters in rank I to be armed with a cannon, the others being the LaGG-3-11 and Yak-1. As the first monoplane fighter for many rank I Soviet pilots, a big change from the reserve biplanes, it is an introduction to a whole new range of tactics and armaments. The LaGG-3-8 should be flown mainly as a fighter. It can be used as a bomber hunter, but it is not well suited to this role due to its average rate of climb and fragile engine. As a fighter, the LaGG-3-8 packs quite a punch at its low rank. The powerful cannon in the nose of the plane allows it to potentially dish out large amounts of damage to unsuspecting aircraft, biplanes, monoplanes and bombers alike. Its heavy armament makes it the perfect aircraft to pounce on carefully selected enemies that are on their own or engaged in a furball at low altitudes. Due to the average rate of climb, this aircraft is best used in diving attacks, booming and zooming in and out of the fray. Another feasible tactic in the LaGG-3-8 is to take advantage of the nose centred armament in head-on attacks. Due to the aircraft's fairly robust airframe, it can take some hits in most areas, even from 20 mm cannons. When performing a head-on attack in the LaGG-3-8, take advantage of the central armament to take some shots from more than 750 m out, then pitching down and pulling to the side slightly. If you see that your opponent has committed to the head-on, pull the aircraft back on target and fire in long bursts. If up against a fighter or single engine aircraft, aim for the main mass of the plane, the fuselage. If up against a heavy fighter or bomber, aim for a single engine or wing. Usually a burst of cannon fire into these areas will do them in. If you happen to come up against an aircraft with similar armament (central cannons), take a few pot shots, roll and dive out of the fight to a safe distance. However, against most other planes, the nose mounted armament of the LaGG-3-8 excels. Another thing to watch out for is the plane's fragile engine, as it can be easily knocked out by aircraft with heavier armament in head-on attacks. At this low rank, there are many planes that can out-turn the LaGG-3-8. Although this aircraft can pull a very fast initial turn, in a sustained turn-fight it will start to show its faults. Its weak engine combined with a heavy airframe means that this aircraft bleeds energy very quickly in tight turns, nosing down during long, low speed turns. Once at this state of low energy, its average climb rate and acceleration worsens, posing it as an easy target for even the slowest of fighters. The LaGG-3 was designed by Soviet engineers Lavochkin, Gorbunov, and Gudkov to replace the LaGG-1. The original LaGG-3 prototype was made almost entirely out of wood. The air frame was made out of special multi-ply wood bonded with resin. The wings were similar to that of the Yak-1, the difference being the LaGG wing was made in two sections. The fuselage was similar to another Russian fighter, the MiG-3. Armament includes a 20 mm ShVAK rapid-fire cannon with 150 rpg mounted in a hollow shaft. A 12.7 mm Berezin machine gun was synchronized and mounted on the engine cowling with 170 rpg. The LaGG-3 had many problems during production, the Klimov M-106 engine was powerful but unreliable. The Klimov M105 however was more reliable but weaker. This led to the LaGG-3 being severely under powered, and disliked by many pilots. This led to Lavochkin's decision to install a more powerful Shvetsov M-82 radial. 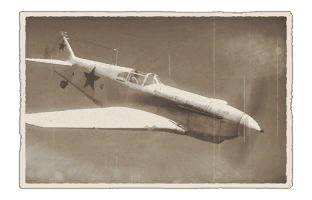 Which gave birth to one of the most feared fighters in the game: the La-5.